Heather and Joe offer lessons to riders of all abilities- whether it is your very first time or you are a seasoned rider. They also provide the perfect instruction for kids to ensure that they are safe and skilled on the trails. Both Heather and Joe are both qualified Level 1 with the Professional Mountain Bike Instructor Association. Heather is also a Level 2 NICA coach (National Interscholastic Cycling Association). To schedule a lesson, please email joew@jugmountainranch.com. Heather is a native Idahoan who has always loved the outdoors. She began road and mountain bike racing shortly after college. When she is not designing, building, instructing or riding the trails at JMR, she is also a firefighter paramedic. During the winter, Heather works as a ski patroller and does search and rescue work with her dog Bergen. Heather continues to do JMR proud racing internationally in the pro women’s field. Joe was born in Michigan, but discovered his love of biking once he moved to the mountains of Idaho. Since then he has made a career out of working with bikes and people, ensuring that each person he comes into contact with has the best day on the trails as possible. Look out for Joe as he drives the shuttle, designs, builds and maintains trails. 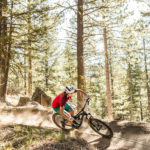 Miles of MOUNTAIN BIKING trails to explore year round. 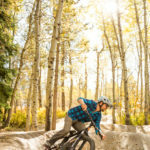 SINGLE track trails exhilarate in summer and fall while FAT BIKES rule on our groomed trails in winter and spring. Dogs welcome! Catch a ride to the top and save your energy for the amazing single track and freeride trails! Please call (208) 634-5072 to make a reservation.